What is a summary of end-time events? Dr. David Reagan and I recently had the pleasure of asking this question of our old friend Evangelist Don McGee on the show Christ in Prophecy. Don is the founder and director of Crown & Sickle Ministries (Rev. 14:14) based in Amite, Louisiana. Don travels all over the Unites States preaching about the soon return of Jesus Christ and speaking at Bible prophecy conferences. 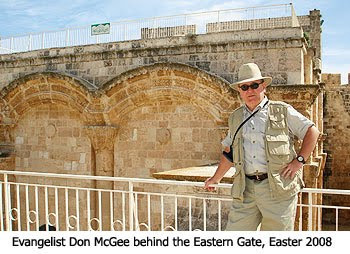 Don McGee: What I am going to do is give you an overview of end-time events from the Pre-Millennial, Pre-Tribulation point of view. There are others out there, but we believe in the literal interpretation of the Scriptures and that presents the Pre-Millennial, Pre-Tribulational point of view regarding end-time events. The very next event that is going to happen is the Rapture of the Church. This is when Jesus comes down from Heaven. He does not come to the earth, but is in the air above the earth. A trumpet is sounded and there is the voice of the Archangel and the dead in Christ rise out of their graves to meet Jesus in the air. When that happens they are going to be given new, glorified, immortal bodies that they will have for all of eternity. Immediately after the resurrection of the dead in Christ those of us who are still alive at the Rapture will be caught up to meet them in the air. That means that this corruptible, mortal body must be shed and we will be given an incorruptible, immortal body just like the Lord Jesus Christ had after His resurrection. Paul talked about this in the Philippian letter. We are going to have bodies like His. There will never be anymore sickness or pain or anything like that. There are some other things that have to do with the resurrection of the Lord's people at what we commonly call the Rapture, but that is it is not a general resurrection. Not everybody is going to be raised at that time. There will be others who will be raised later like the dead who are not Christians and then the Old Testament Saints at another period of time as well. The Rapture is a family affair just for the Church. So, when we are caught up to meet the Lord in the air we are going to go back to Heaven with Him. What will happen while the Church is in Heaven is that on earth there will be a very, very terrible time of tribulation. Jesus talked about this in Matthew 24, Luke 21, and in the book of Revelation, too. People who are left behind are going to experience suffering that is unprecedented. Jesus said if it were not for the intervention of God by sending Jesus at the end of that Tribulation to establish His Millennial reign on this earth, then no flesh would survive. When you look at the Book of Revelation, there are three sets of seven events that are going to happen during the Tribulation. There will be seven seals that will be broken, and then seven trumpets that will be sounded, and then seven bowls of wrath which will be poured out on the face of this earth. Now remember, when we read these things we need to understand that though there is symbolic language in the Book of Revelation regarding these events, that symbolic language points to very literal events. For example, by the time the first four seals are broken in Revelation 6, 25% of the earth's population will have died from famine, war, diseases, and wild animals. If people believe that they can escape committing their lives to Christ at this time and can go on living the way that they want to and believe that they can become Christians becoming saved during the Tribulation, then they are walking on very thin ice for a couple of different reasons. If you are sitting out there thinking that, then you really need to pay attention to this. Number one, if you reject Jesus Christ now there are some things said in Paul's letter to the Church of Thessalonica that could indicate your heart will be hardened to the point that you will continue to reject Him. Number two, there is a good chance that you are going to be killed during this Tribulation time even before you might get to the point of accepting Christ as your Savior. The Tribulation is going to be a time that is unprecedented in its horrors, but it's going to end with an event that is just so beautiful and so fantastic that it's very difficult to understand. Zechariah in chapter 14 wrote about this event, and in the Book of Revelation in chapter 19 John saw it and recorded what he saw. This is the coming of Jesus from Heaven back to this literal earth. He is going to come to the Mount of Olives, and the Bible tells us that when He arrives at the Mount of Olives that mountain is going to split north and south allowing an east-west valley into which people who are still alive in the city of Jerusalem will flee into. The reason they are going to flee into that valley is Jesus is going to do business with His enemies at that time. We are told in Revelation 19 that Jesus' enemies are destroyed. They are killed by the very word of Christ as He rides in on that horse. But, Zechariah says some things that are different. Zechariah says that their eyes and their tongues and their flesh will rot even before their bodies hit the ground. Some people believe that is the result of a nuclear catastrophe, though personally I do not believe that. I believe that it simply means that Jesus will choose to destroy His enemies. These are enemies not only of Christ, but of the Jewish people as well. During that seven year period called the Tribulation, the Jewish people are going to experience trials like they've never seen before. It is going to take that kind of tribulation for them to finally recognize that Yeshua, Jesus, is their Messiah. They are going to be brought to a point where they will cry out to the one whom they pierced, and they will say, "He's our God," and He will say, "They are my people." When Jesus arrives on the Mount of Olives He is going to have believers with Him. That's us! We are coming back with Him. Now, I don't understand every detail of that, but my belief is not based upon my understanding but simply in the faith in the literal Word of God. We are going to be with Jesus as He leaves the Mount of Olives and as He marches through the Brook Kidron. Next, Jesus is going to go through the Eastern Gate of the old walled city of Jerusalem. Several hundred years ago the Turks walled that gate up and said, "We are going to prevent the Messiah from ever coming back." Then they established a graveyard right in front of that gate because they believed that no Jewish Rabbi would ever come close to those graves and so become ceremonially unclean. They felt that the blocks in the wall could prevent Him from entering. I find it interesting that the Muslim Turks took this prophecy literally and understand the Scriptures literally, while many in Christendom today try to spiritualize it. I would encourage you to look at this from a literal standpoint. When Jesus comes back and goes through that gate He is going to go into the Old City of Jerusalem and He is going to establish Himself on David's Throne just like the angel said to Mary in Luke 1. Jesus is going to be king over all the earth and Christians will be with Him to assist in the governance of this planet. It's going to be a wonderful time! In Isaiah 11 we are told that wild animals will be freed from the curse, that a lion will actually become herbivorous and will eat hay like a cow, and that a bear will be in the same pasture as a young calf and also be herbivorous. It says that God is going to cause the nations of the world to take their implements of war and beat them into implements of agriculture. And, there will be a peace on the earth that is going to last for 1,000 years. Then, an interesting event happens. During this 1,000 years in which Satan is bound, he is going to be released for a short period of time to deceive the nations of the world. Satan is going to convince humanity that they can fight God. That indicates to me that not everyone during the Millennium will be a disciple of Christ. Even more important than that, it indicates to me that environment has nothing to do with the human heart. It is evil and wicked just like Jeremiah said. For 1,000 years people lived under the absolute perfect reign of the Son of God, and here in a short period of time the Deceiver comes out and He is able to convince them that they can fight God. We find that they are going to be destroyed. Satan is going to be captured and he is going to be thrown into the Lake of Fire. Finally, we have the eternal state. In 2 Peter 3, we have a brief account of how the heavens and the earth will be destroyed. After that destruction, there will be a new heaven, and out of this new heaven comes this new earth. The new city of Jerusalem will descend out of Heaven, and in some kind of way that only God knows the details of, it is going to be established on this new earth. It will be a city that is 1,500 miles cubed, and we are going to live there for all of eternity. You may very well be thinking that this is all very difficult to understand and claim, "I don't know about this literal interpretation of Scripture because I don't understand it." Well, it is much easier to understand the literal truth of God's Word than it is to try to comprehend some spiritual, allegorical means of interpretation. When you use a spiritual interpretation or allegory, you can become God since you can make Scripture mean anything you want it to mean. The consequence of that when there are ten people spiritualizing the Bible then you've got ten different opinions. But, no, we can stand firm on the literal Word of God, understanding that nothing that happens takes God by surprise and every event that happens is being used in God's orchestration of events that have to do with the Rapture of the Church, which is the very next event. I would encourage you to read these things for yourself. God gave you a mind. He gave you a brain with the ability to think and to comprehend. As a Christian with the Holy Spirit in your heart, you can discern these things and come to a literal interpretation of what He said. May God's riches and deepest blessings be upon you! This is the first time I have heard anyone say that the Old Testament believers will not be ressurected in the Rapture. Where do you place their ressurection? There will be a resurrection of Church Age saints at the time of the Rapture, before the Tribulation begins (1 Thes. 4:13-18). At the end of the Tribulation, Old Testament saints and Tribulation martyrs will be resurrected (Dan. 12:1-2 and Rev. 20:4). And finally, all the unjust who have ever lived and died outside a faith relationship with God will be resurrected at the end of the Millennium (Rev. 20:11-12). The first resurrection exists in three stages: 1)Some Old Testament Saints after the crucifixion of Christ-Mathew 27:52-53. 2)Jewish and Gentile believers in the Rapture-1 Cor 15:23;1 Th 4:14-17. 3)Tribulation Saints-Rev 14:4; Rev 20:4. Blessed are those that take part in this resurrection, for those that participate in the second will have their place in the Lake of Fire. Just got my latest FREE DVD as a Prophecy Partner. Looking forward to the FREE DVD in August (I think) of Dr. Reagan's presentation at the recent Bible Prophecy Conference. And looking forward to the opportunity to take advantage of the Prophecy Partner DISCOUNT on the DVD of all the speakers at the last Bible Prophecy Conference and Dr. Reagan's new book. I now have over 50 Lamb & Lion DVDs, the vast majority FREE (as a gift as a Prophecy Partner). MOST WONDERFUL OF ALL...I feel so blessed everytime I get a postcard from Lamb & Lion saying I was in their prayers!!!! If you are not a Prophecy Partner please consider it. It's really a blessing not only to you personally but to a ministry you love. I'm not sure about #1, Rodney. At Jesus’ crucifixion, according to Matthew 27:53, those handful of Old Testament saints who came back to life “went into the holy city and appeared to many people.” Like Jesus' other miracles of bringing people back from the dead, these resurrected people lived on in their earthly bodies on earth until their next natural death. They did not resurrect and then go to Heaven, because Jesus was the true and only "firstfruits of those who have fallen asleep" as 1 Corinthians 15:20 declares. Also, during Jesus' ministry, each person He raised back to life, like Lazarus (Jn. 11:43-44), Jairus' daughter (Lk. 8:52-56) and the widow of Nain's son (Lk. 7:13-15) all lived normal lifespans to die once again. There are those who believe the people who were resurrected with Jesus had glorified bodies and only spent some time in Jerusalem before ascending to Heaven when Jesus did. While their ascension timing is only speculative, it would add to the numbers along with Jesus being the fulfillment of the Feast of the Firstfruits mentioned in Lev. 23:10-14. As a token of the coming harvest, the people would bring a handful of grain to the priest. Jesus and the others resurrected then would be that Firstfruit offering, with the main harvest being the Rapture to come and the leftover Gleanings those who will believe and die during the upcoming 7-year Tribulation. Both views are viable. I take the first one because I feel the weight of the evidence falls to Jesus being the only firstfruit offering, as He gets all the glory. Wow, Billy, what a testimonial!